This week’s photo is thanks to Dan Nichol, who wrote to me back in April with his regrets that he could not attend the Reunion. He was a grad student at HMSC from ~1986-1989 and had some great memories of his time here. 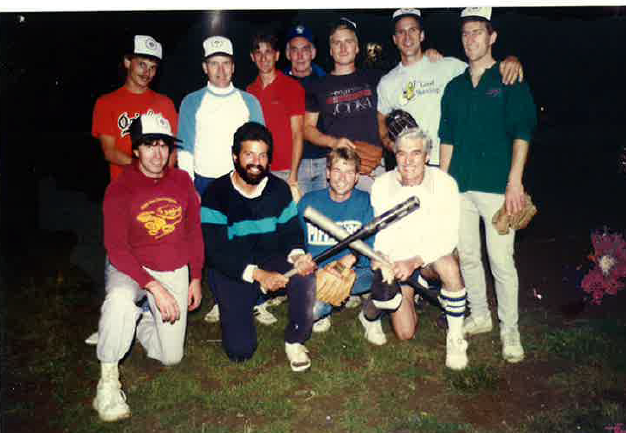 Top row: D. Kreeger, ?, J. Levin, J. Lannan, B. Dziak, B. Chadwick, B. Applegate. Lower row: D. Nichol, ?, D. Clapp, D. Baumgartner. Maybe someone can help out with the missing names?” If you have any information, please let me know at maryann.bozza@ oregonstate.edu.